EF-BC3G-26 is a range of highly efficient and portable antennas for 2G/3G/4G modems and datacards. These paddle style antennas are easily positioned on a device housing or vehicle windscreen using the supplied automotive industry grade adhesive pad. 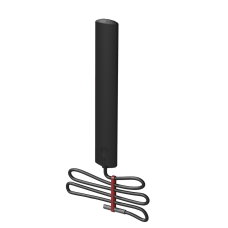 The antenna is constructed from weather resistant plastic and is suitable for use in semi-exposed scenarios. The antenna is ultrawideband and ground plane independent making it ideal for global machine-to-machine and mobile data applications. Covering 698-960 / 1710-2170 /2396-2700MHz, the EF-BC3G-26 is designed to support the full range of 2G/3G and 4G frequencies globally.